Today is my day off (yay!) so I have time to catch up on cleaning and organizing, which I have been putting off. 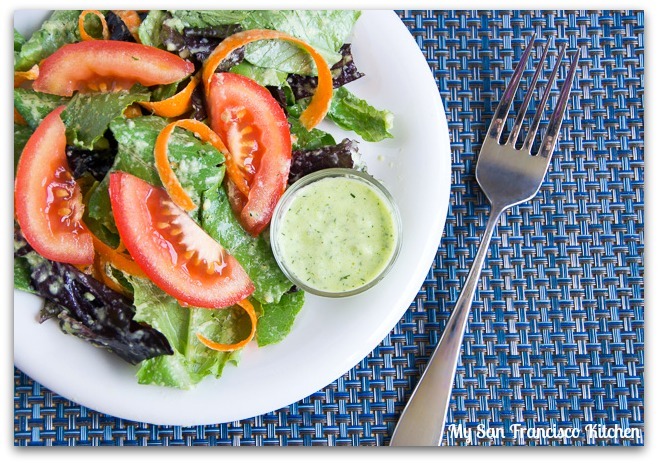 For a quick lunch, I made this simple green salad tossed with a homemade creamy zucchini herb dressing. I love to make my own salad dressings because it saves a lot of money, there are no preservatives, and I can control the amount of salt I add to them. This dressing only takes a few minutes to make, and gives a simple salad a lot of flavor. It is made with fresh organic zucchini, plain yogurt, olive oil, lemon, garlic and herbs. I used dried oregano from my Grandma’s garden. I like to pulse my blender a few times to keep a chunky consistency, because I love eating raw zucchini and in a salad it is even better! Next time I will add some cucumbers to my salad, too. Careful not to add too much garlic, or it overpowers the entire dressing (oops-have done that before!). 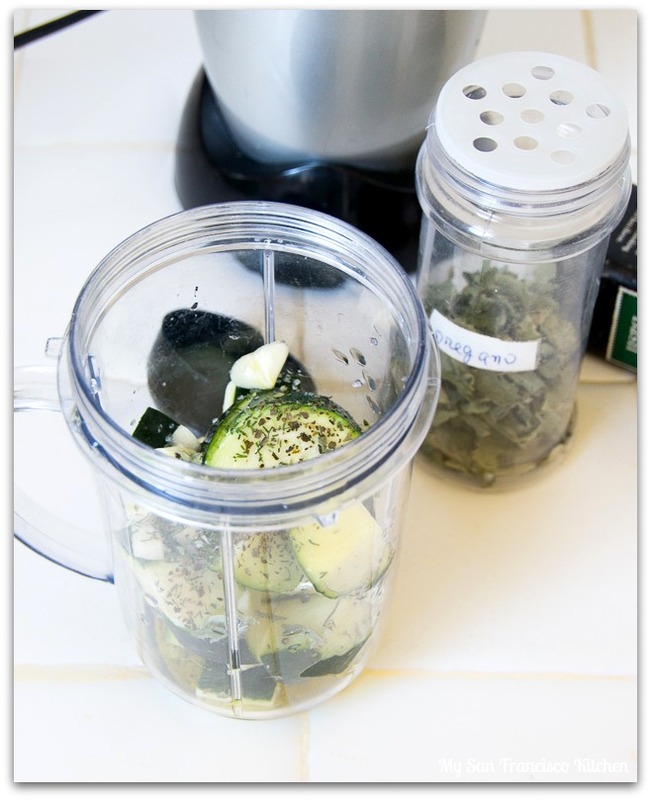 Add all ingredients to a blender and pulse for a chunky consistency or blend until smooth. Keep in the refrigerator until ready to serve, up to 3 days covered. This entry was posted in Dressing, Lunch, Salads, Vegetarian and tagged blender, carrots, herbs, salad, tomatoes, zucchini. What a great idea to use fresh zucchini in salad dressing. Brilliant. The dressing looks great, nice summery flavor. I adore using fresh veggies in dressings. Everything about this dressing is genius! 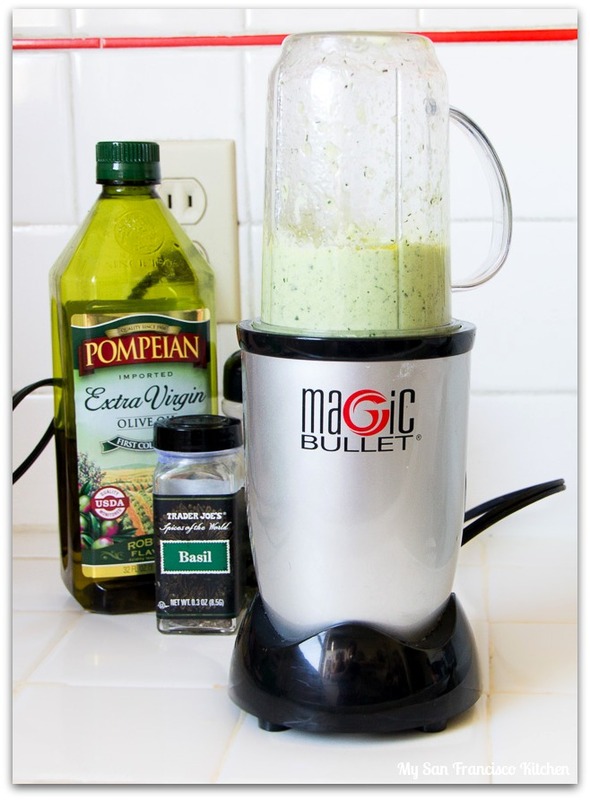 I love that you thought to use your magic bullet to make dressing! It opens up so many more options! I usually make my own salad dressing too — so much better, isn’t it? This looks terrific — so flavorful! Thanks. I love how creamy this looks, but it’s probably like 473243 times healthier! Mmmm – pretty and delicious! Don’t you love summer flavors? Pinning this for sure!